Just wanted to pop in and do a quick post about what’s been going on at Windermere this week – It’s Community Service week where the whole team over here does our bit to help out! This year, I’m heading up the program and I’m so happy to be helping out a wonderful local organization – Community Warehouse. This volunteer based organization helps low-income family turn their houses into homes by providing home goods such as dishes, glasses, pots and pans, sheet, blankets, towels etc. Here’s a list of exactly what is needed and what they do not accept. 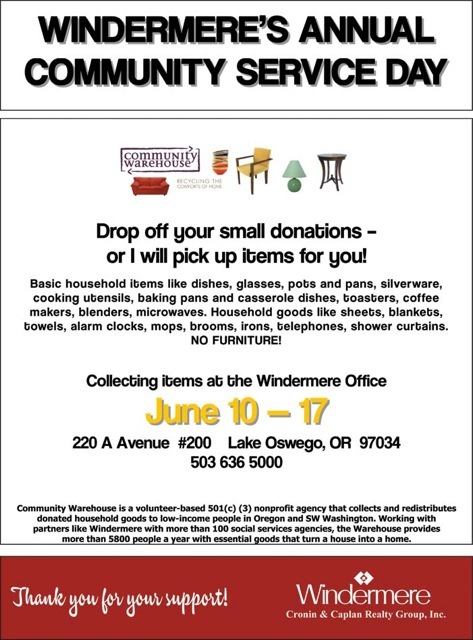 Locals have been going through their households, cleaning out what they don’t need and dropping off goods at the Lake Oswego Windermere office. It’s been fantastic seeing the residents really pitch in and donate some great items! We only have one more day – so go thru your stuff and see what you can part with. It’s a win win. You get a more organized house and the great feeling of helping those in need!